Edmonton freezeway design: An artist’s rendering of Matt Gibbs’ proposed Edmonton ‘freezeway’ design. A UBC graduate who grew up in Edmonton has come up with Canadian climate-inspired way to solve his hometown’s wintry commuter woes. 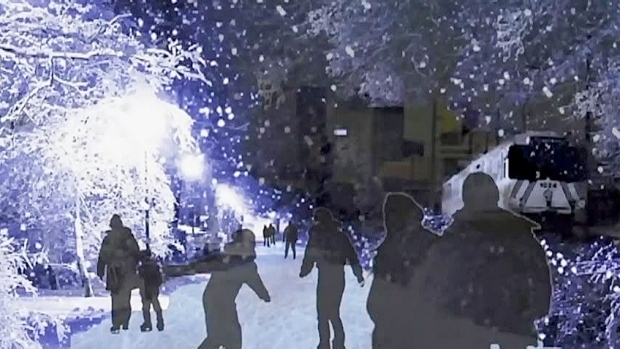 Matt Gibbs, a landscape architect, has designed a “freezeway,” an artificial ice thoroughfare, that he said would let Edmontonians leave their cars at home and skate their way to work. Gibbs’ proposal involves converting a former railway right-of-way that stretches into Edmonton’s downtown corridor from two sides. The 11-kilometre route, he said, would allow people to skate — or winter-cycle — to work, school, even an Oilers game. Speaking on CTV’s News Channel on Tuesday, Gibbs pointed out that the City of Edmonton prepared a winter strategy looking at how its residents can better embrace winter. After all, Edmonton’s climate is such that its population resides in below freezing temperatures for five months of the year. Canada, Australia and New Zealand tonight signed a mutual recognition arrangement (MRA) that allows for fast-tracked cross-border registrations of senior architects between the three economies. The MRA came about as a result of Canada’s, Australia’s and New Zealand’s participation in the APEC Architect Project. All three economies maintain an APEC Architect Register of senior architects who have met a number of criteria including having at least seven years of senior experience. As a result of the MRA, an APEC Architect in Australia or New Zealand is entitled to registration in Canada as of right, apart from being assessed about any aspects of the architectural process in Canada that is specific to Canada. The same applies for a Canadian APEC Architect applying for registration in Australia or New Zealand. Canada is obliged under the MRA to accept Australia or New Zealand’s assurance that the Australian or New Zealand APEC Architect making the application is competent and safe to practise in terms of the generic skills, knowledge and attitudes required of an architect. The Illuminating Engineering Society of BC (IESBC) in conjunction with BC Hydro invites you to attend a seminar on today’s evolving lighting technology. Presenter Chip Israel, internationally recognized lighting designer with over 27 years of experience and past president of the Illuminating Engineering Society North America, will provide a glimpse into future lighting technologies, discuss the incorporation of controls to save energy and transform architecture, and a review of case studies and design applications. With billions of dollars going into building new facilities and renovations across Canada because of the aging infrastructure, technological advancements and the redefining of patient care, a significant opportunity is before us to reshape healthcare. Innovative technologies will play a key role in transforming healthcare environments to increase efficiencies and improve care. This learning seminar focuses on recent technological innovations adopted in healthcare facilities from across Canada. Case-studies of evidence-based, technological innovations will be presented by key project healthcare champions and their industry partners. Join IXL Masonry Supplies for an afternoon of AIBC accredited seminars. Lunch and light refreshments will be served. Adhered Masonry Veneers: Presented by Bob Proctor of I-XL Masonry Supplies Ltd. This training program discusses types and advantaged of adhered masonry veneers, installation techniques, the importance of proper mortar use, among other considerations. This session will demonstrate several design options as well as current masonry veneer comparisons, crack control, differential of movement and mortar options along with other considerations. Designing with Brick: Presented by Rob Mutch of I-XL Masonry Supplies Ltd. This session will explain the benefits of clay masonry, describe available colours, textures, sizes and methods of clay brick manufacturing. This training will help attendees understand proper brick detailing and will identify the differences in brick. This panel discussion, hosted by IBPSA-BC, will provide tips on what it takes to reach upcoming VBBL and LEED (including V4) energy targets. Representing a wealth of experience, panelists will help uncover common communication barriers within teams, and facilitate the understanding of how energy modelling can be used at different stages of design (i.e. concept design, schematic design, design development and construction ) to meet sustainability goals at a reduced capital cost. Curt Hepting, President, EnerSys Analytics Inc.
Architects, specification writers, contractors and designers are invited to the Terrazzo, Tile & Marble Association of Canada’s 10th Biennial Tech Expo. Seminars have been approved for AIBC learning credit and topics include: soundproofing and heated flooring; new generation bathrooms; rebirth of the ceramic craftsman; outdoor living spaces; and, large format slim tile for interior walls and floors. Location: SFU Harbour Centre, 515 West Hastings St., Vancouver, BC. This course introduces the equipment used to generate electricity from solar power, such as photovoltaic modules, batteries, inverters and charge controllers. Participants are taught to identify the various components, understand how the components interact and interpret manufacturer’s specifications. Design principles of stand-alone photovoltaic systems are explained and participants visit demonstrations of PV systems on the BCIT campus. At the end of the course, the participants should be able to: analyze the solar energy resource of a potential site; explain the function of each PV system component; interpret performance data for each PV system component; identify the different types of PV systems; specify the main component of an off-grid PV system; perform basic PV system maintenance. Roofing Contractors Association of British Columbia (RCABC) invites you to attend an informative morning and lunch featuring presentations tailored to the building design community. Mike Demers raises thought provoking issues for the design and construction community regarding shop drawing liability. This presentation exposes areas of unclear accountability and potential risk for further examination in the design and construction community. Mike’s practice at JML is focused on construction related matters. This includes advising clients on tendering, construction contract drafting, dealing with on-going project disputes, builder’s liens and, finally, the resolution of claims through trial, mediation or arbitration proceedings. As Vancouver strives to be the greenest city in the world, architects, builders and developers are increasingly being asked to create energy efficient buildings and communities. Some municipalities are making rezoning approvals contingent on LEED certification and connections to District Energy Systems. While the building industry wants to do its part to reduce greenhouse gases, some industry experts question whether current and emerging practices are in everyone’s best interest. Michael Geller is a Vancouver based architect, planner, real estate consultant and property developer. Once described as an ‘accidental environmentalist’, he wants to encourage a rational discussion on how best to create sustainable communities without compromising good development and building practices. The presentation highlights green roof systems using 3 dimensional details included in the RCABC Guarantee Standards. The presentation covers green roofing design challenges and good roofing practices. Hamish is Trade Qualified (TQ) and a Red Seal Ticketed Roofer. Hamish provides technical support to the design community through review of roof details, assemblies, specifications and inspection re-ports. Hamish helps design authorities interpret and effectively use the RCABC Guarantee Standards with the ultimate objective of ensuring good roof design and practices.